Shopping for Battlestar Galactica Artwork? Commander Adama's daunting challenge. 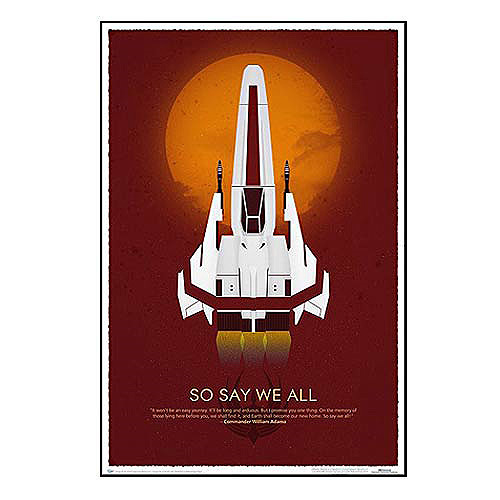 Celebrate the 10th anniversary of the critically acclaimed, reimagined Battlestar Galactica TV series with this stunning poster - third in a line of best-selling sci-fi tribute art prints. Featuring the iconic Viper Mark II eclipsing a orange star, the Battlestar Galactica 10th Anniversary Art Print reflects the minimalistic, evocative style of our other anniversary prints. Commander Adama's words convey the daunting challenge for his ragtag fleet: Escape the genocidal Cylons and find the shining, mythical world called Earth. The Battlestar Galactica 10th Anniversary Art Print was created by QMx Design Director Mohammad Haque using a design style pioneered by QMx contributing artist Jeff Halsey. It is the same size as a movie one-sheet and printed on heavy, satin-finish paper. Celebrate four seasons of breakthrough television with this amazing work of art. So say we all! 27-inches wide by 40-inches tall. Ages 14 and up.